We take great pleasure in introducing our Auditing theme for auditing companies, accounting firms, chartered accountants, professional auditors, chartered financial analysts, cost accountants and hosts of other accounting related professionals. Auditing theme is a specialist theme for the special segment of financial management professionals. Our design has taken into account, the specials needs of this segment for meticulous planning and execution of their sophisticated concepts. After extensive research on the available themes and the requirements of the auditing business, we designed Auditing theme with many unique inner pages. We have added careers page, resources page, services page and tips page. Each of these pages would help you customize your site exactly the way your business is structured. We have thoughtfully integrated the following Plugins namely Visual Composer with the Ultimate Addon, Kirki toolkit for an amazing UX/UI interface and finally the Contact Form 7 for designing different types of forms that you may require. We have integrated the vacancy section in this page so that, candidates who are desirous of joining could easily do so by clicking on the post he or she is interested in. On clicking,the job description of the post applied for would be displayed. The Contact Form 7 has been very creatively used here to capture the details of the candidate. The resume could be uploaded as well. Using the resources page, you would be able to display your plethora of services in different modules. 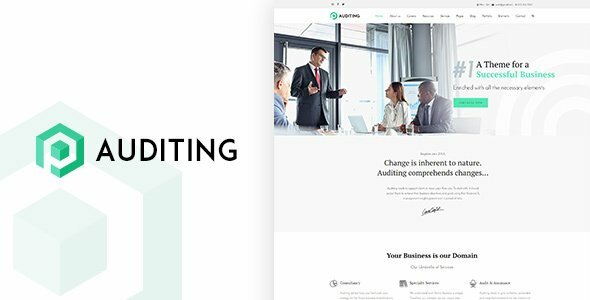 Auditing theme offers side navigation features containing 5 section tabs so that you can describe your sophisticated services at will. Auditing theme offers the integration of the Plugins that are indispensable for empowering your websites. Kirki is the ultimate toolkit for theme developers using the WordPress Customizer.Auditing theme lets you take advantage of its advanced features and flexibility. Simply by abstracting the code, it is easy for everyone to design beautiful and meaningful UI. In addition, you can easily add configurations for your projects. The ease with which you could do is the most useful part of Kirki. It helps you save time which is great! Create you panels and sections. Customize and add fields with ease. It helps you to automatically create CSS from your fields. All this in real time while you preview the changes via the customizer’s preview instantly. Using the automatic post-Message scripts creation! You will become a professional designer by adding Google Fonts with typography field. In addition, you could add tooltips to help your users. Using the defacto standard WooCommerce Plugin, Auditing addresses your needs of online sales, payment gateway and collection in easy steps. Configure the layout and start your online store in style! The Visual Composer with its inherent advantage of drag and drop features makes it exceedingly easy for you to customize your site like professional designer without codes! Ultimate Addon is integrated too, so that the whole suite of these Plugins empowers your site. Additional functionalities such as wish list creation and other supportive features for ecommerce initiatives make this theme a cool auditing theme for the professionals like you. Using the single click demo install import the demo data easily. Then using the demo data, customize your site with the readymade features and elements. Design your logo and off you go for starting your online presence! Using contact form 7, design as many forms with unlimited number of input row fields in your form. You can design you own forms and limit spam and increase conversion. Whether it is mobile phones, tablets or desktop PCs, Auditing theme will load quick giving you an edge in terms of speed and ease of loading. Every element is responsive in Auditing theme, so that your site will load in any device really quick. In Auditing theme, there are 9 types of portfolios available for you to choose from. For example there are Art Portfolio, Classic Portfolio, Girly Portfolio, Icons Only Portfolio, Minimal Icons Portfolio, Modern Title Portfolio, Presentation Portfolio, Icons Overlay Portfolio and the Title Overlay. Each of these options offer enormous opportunities to display your content to be engrossing. Auditing theme 5 types of blog layouts namely Blog – Date And Author Left, Blog – Date Left Blog – Medium, Blog- Medium Highlight, and Blog – Skin Highlight. The variety in display gives you the opportunity to display your services and images in a gorgeous way to engage your visitors and customers like. Auditing theme offers a plethora of shortcodes to configure your modules like tabs, accordions, buttons and tooltips. The shortcodes offered in Auditing theme is mind boggling. Well, almost every conceivable need has been analyzed and these shortcodes have been included. All the requirements of your site for Blockquotes, Buttons & Lists, Carousel, Columns, Contact Info, Content Shortcodes, Custom Posts, Fancy Boxes, Icon Boxes, Image With Caption, Miscellaneous, Number Counter, Pricing Table, Progress Bar, Tabs & Toggles, Team, Testimonials, Carousel Testimonials, Timeline and Typography. With more than 600+ Google webfonts and the FontAwesome icons, you can set any color or size in your site and design your pages at will. Using the extensive documentation, knowledge base and video tutorials you can get any clarification you may require about Auditing theme, 24/7. Therefore, make an informed choice and go for Auditing theme.